There’s probably something to be made of the fact that despite being credited with having invented the idea of cyberspace, the thing William Gibson actually invented in his seminal 1984 novel, Neuromancer, doesn’t bear all that much resemblance to reality. We don’t have decks or simstim and we don’t jack into cyberspace through neural connections, instead we have virtual communities on Facebook and online shopping, and while hacker groups like Anonymous and figures like Julian Assange might well have stepped out of the pages of one of Gibson’s novels, most datacrime has more to do with stealing credit card details than facing down malevolent megacorporations. It’s not a disparity that bothers Gibson. Despite having established himself as one of the few genuinely visionary writers of the past few decades, Gibson has always recoiled from the idea his writing (or indeed Science Fiction in general) is in the business of prediction. Yet despite Gibson’s caveats, there’s little doubt his futures are now our present, if not in their detail then in their textures. Certainly it’s difficult to think of a writer who has more consistently understood the manner in which technological change is transforming both our inner and outer worlds. Nor is there a writer – except maybe for Delillo – who has shown themselves better attuned to what he himself describes as the “workaday level of cognitive dissonance we now take utterly for granted”. Given his influence, it’s perhaps surprising that these are questions Gibson has explored almost entirely through the medium of fiction. For while writers such as his friend and sometime-collaborator Bruce Sterling, or more contemporary Science Fiction pundits such as Cory Doctorow have carved out not-inconsiderable parallel careers as commentators on technology and copyright and politics, Gibson has – at least until the advent of Twitter – chosen to remain more aloof, appearing only occasionally in public and producing very little non-fiction. 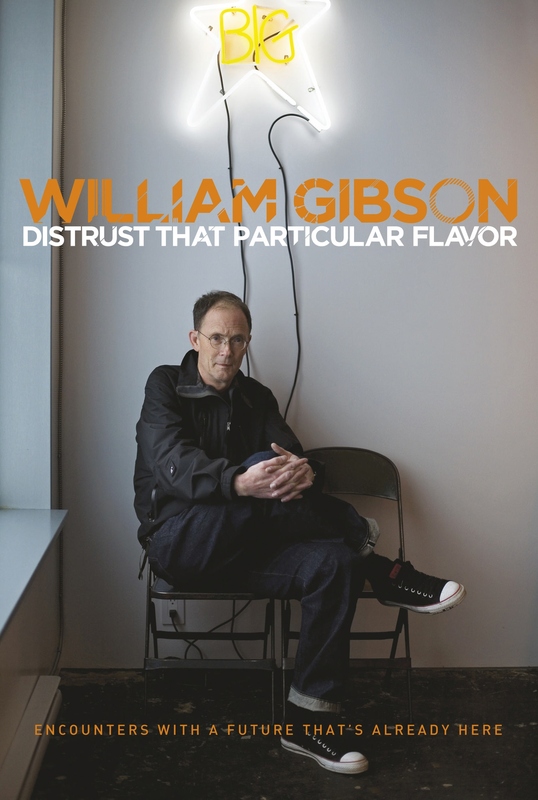 In the introduction to his new collection of non-fiction, Distrust That Particular Flavor, Gibson claims this aloofness was a conscious decision, a reflection of his early commitment to writing fiction. “Self-discipline never having been my strong suit, I became uncharacteristically strict with myself about writing only fiction”. The articles, essays and occasional pieces gathered together in Distrust That Particular Flavor might be “violations of that early prime directive” but they nonetheless possess much of the same subversive power. Gibson once described his first encounter with William Burrroughs as somewhat akin to having the top of his head taken off with a can opener: reading Gibson might be less confronting but it’s no less destabilising. As ever much of the brilliance lies in his capacity to reveal the weirdness in the world around us. While more conventional writers agonize (or perhaps more disturbingly, don’t agonize) about how to interrogate a present so weird and multiplex it seems to exceed description Gibson takes pleasure in revealing that the strangeness is now part of us. Of course this sort of creative estrangement has always been central to the project of Science Fiction: reveal the weirdness in the world around us and it becomes impossible not to see it anew. Yet Gibson’s approach doesn’t require ray guns or spacecraft. Instead he takes things we take for granted – the internet, cinema, the city – and quietly, coolly, quizzically reminds us of the way technology is rewriting our cultural and psychic DNA. These questions are front and centre in pieces such as a talk written for the 2010 Book Expo in New York, or another given in 2003 to the Director’s Guild of North America (in which he ruefully confesses his failure to really grasp the manner in which technology would eventually disrupt publishing, just as it had the music industry and Hollywood), but it’s no less present in ‘Dead Man Sings’, a piece written for Forbes in 1998 about the way the Future is already collapsing into the Now, and in travel writing such as ‘Modern Boys and Mobile Girls’, in which Gibson unpacks his fascination with Japan, “the global imagination’s default setting for the future”. Yet in a curious way this slim, never less than fascinating collection is at its best when it is at its most personal. In ‘Rocket Radio’, a piece written for Rolling Stone in 1989, Gibson describes a boy listening to Chubby Checker on a crystal radio wired to a fence in Virginia, and later, the same boy intuiting the purpose of a spool of 8-track tape found by a roadside, illustrating as he does the way “[t]he Street finds its own uses for things – uses the manufacturers never imagined,” an observation that sums up so much about Gibson’s bemused, delighted fascination with the strangeness of the world we inhabit. First published in The Age and The Sydney Morning Herald, 21 April 2012.